Our preschool friends in Canandaigua love to be active, so we find creative ways to get them moving. 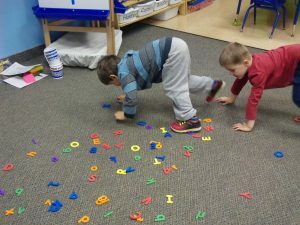 In the activity, “Lumbering for Letters,” our friends would lumber like a bear to find “food,” which was a letter, to bring back to the cave. 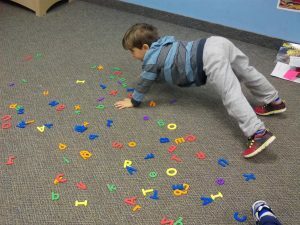 During this movement center, the preschool children are practicing skills which include; letter identification, taking turns, maintaining their balance, as well as coordination skills. So many skills can be practiced with one simple activity!